FAQs - Which Sat Nav? What maps will be included with my device? The manufacturers will release the same device in numerous countries. The devices will always cover the country of sale. This description gives nothing away as to the mapping software included. In this instance it is essential to delve a little deeper and either read the packaging or find a review of the product. Yes, in all the devices we have seen on the market it certainly does. To be absolutely certain however check the back of the box. There is usually a list of the countries covered and a shaded map to highlight those countries. Feel free to contact us if you have any questions or require any clarification. 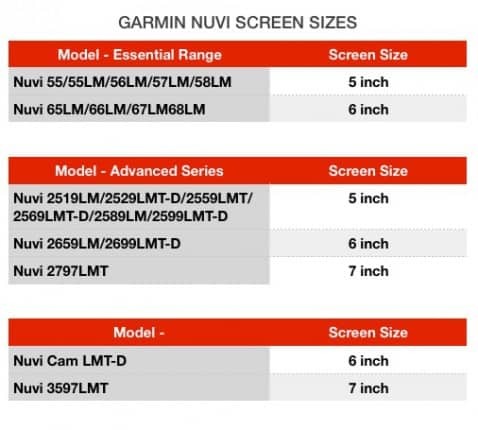 Similarly, the name of the model will nearly always provide a pretty strong clue to the size of the screen. Check out this table below for the details of some of the more popular models available on the market.